How much does it cost to travel to the British Virgin Islands? How much money will you need in the British Virgin Islands? $264 is the average daily price for traveling in the British Virgin Islands. The average price of food for one day is $57. The average price of a hotel for a couple is $352. Additional pricing is in the table below. These average travel prices have been collected from other travelers to help you plan your own travel budget. How expensive is the British Virgin Islands? How much money do I need for the British Virgin Islands? The British Virgin Islands are a self governing British overseas territory. In 1648 they were settled by the Dutch and were then annexed by the British in 1672. They're located just east of the US Virgin Islands and are a popular destination for beach lovers. There are more than 60 islands and keys that make up the territory, and 43 of those islands are uninhabited. The main islands are Tortola and Virgin Gorda, both of which are steep and volcanic in nature. Some of the islands, including Anegada and Sandy Spit, are flat coral islands. In particular, Anegada is called the "drowned island" because of its low elevation. The British Virgin Islands have a tropical climate that is kept mild by the easterly trade winds. The humidity is generally low and the temperature stays consistent throughout the year. This comfortable climate is a large part of the appeal for visitors to the country. The low season is during the hurricane season when weather is more unpredictable. The British Virgin Islands have a stable economy that is heavily reliant on tourism along with the offshore financial industry. Tourism provides approximately 45% of the national income. Tortola is the largest of the islands and home to the capital city of Road Town. It is about ten miles long and three miles wide. 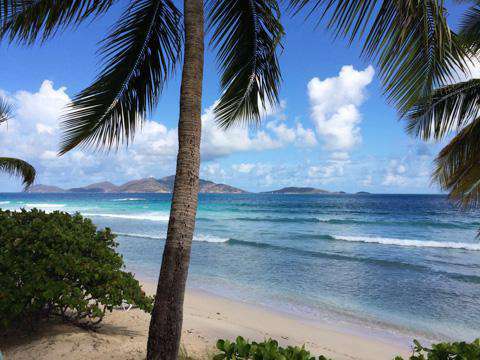 Other popular islands to visit include Virgin Gorda, Anegada and Jost Van Dyke. One of the best ways to explore the islands is by boat. It's possible to rent both sailboats and motorboats and also hire a crew. Conditions can be unpredictable so if you don't know what you're doing, you should definitely hire a crew. The many beautiful uninhabited islands make this a wonderful place to explore by boat. Many chartered boats can be arranged from Road Town on the island of Tortola. On larger islands it is possible to rent a car to explore. The smaller islands are easily explored by foot as there are many trails and paths you can follow. Scooter rental may also be an option. Rental car agencies can be found at the airport and elsewhere on the island of Tortola. The roads are not always in great condition and drunk driving is not uncommon. You can find many different shopping opportunities in the British Virgin Islands. There are locally made items as well as high end merchandise. In general, international chains are banned throughout the country in order to maintain a local character. The best shopping area on Tortola is Wickham's Cay in Road Town. Like elsewhere in the Caribbean, Rum is a popular drink throughout the country. There are a variety of cocktails made with rum at any of the bars around the beaches and in town. One local favorite is the "Painkiller", which is made with rum, coconut and orange juice. Ask for the bar's specialty and you generally won't be disappointed. Most bars have a happy hour between 4 pm and 6 pm. Nightlife in the British Virgin Islands is generally good, particularly around Road Town. It's worth checking out both tourist hot spots as well as local bars, as the atmosphere can vary. To find a local establishment, just ask around town. Many bars have great views of the sunset so you can enjoy a drink as you watch the sun dip below the horizon. Local clubs are also great places to here some of the island's local music. Josiah's Bay: This is a popular surfer's beach that is used by tourists and locals alike. During the right season the waves can be quite substantial. There is a gradual drop off into the water, so swimmers can venture relatively far from shore and still be at a safe depth. There are two restaurants nearby that are casual and reasonably priced. Brewer's Bay: With dark golden sand, this is the only non-white sand beach on the island. When the weather is clear there are good snorkeling opportunities available, but if it has recently rained the runoff can effect visibility. There are several good food facilities available nearby as well. Cane Garden Bay: This is the most popular and crowded beach in the British Virgin Islands. There are boats that anchor here and the beach is lined with restaurants and bars. There is often live music being played and a festive atmosphere, but if peace and quiet is what you're after, this is not the place for you. This area becomes particularly crowded when cruise ships are docked. Food in the British Virgin Islands is comparable to that found elsewhere in the Caribbean. There are some local flavors and preparation techniques, but many of the dishes are common throughout the Caribbean. Is is expected, seafood is abundant, as is tropical fruit. Many dishes are prepared as soups and are wonderfully flavored with local herbs. Callaloo Soup: This is a common dish throughout the Caribbean, including the British Virgin Islands. It is made with the leaves of a daheen plant, okra, local herbs, and any number of meats or seafoods. Fungi: This dish is also found elsewhere in the Caribbean. It is made with cornmeal and okra and is often served with salt fish. Salt Fish: This preparation of fish is common in many island dishes. It can be boiled or fried and served with breadfruit. Breadfruit is a local fruit that has a similar flavor to potatoes. Chikuzen, Inganess Bay, Fearless, and the Parmatta. Most of the underwater area is protected as reserves or national park land, or by other means. Boat moorings are maintained by the park service, and precautions are taken to ensure the protection and preservation of the reef and other wildlife. BVIScuba.org is a good website to find a scuba outfitter.